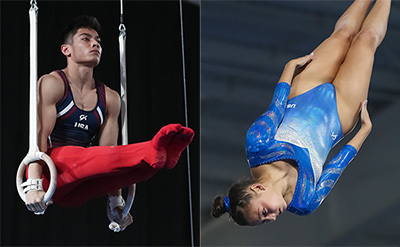 BUENOS AIRES, Argentina, Oct. 8, 2018 – Brandon Briones of Gilbert, Ariz./Aspire Kids Sports Center, qualified for the still rings and vault finals, and Alyssa Oh of Rocklin, Calif./World Elite Gymnastics, advanced to trampoline finals at the 2018 Youth Olympic Games in Buenos Aires, Argentina. Gymnastics’ qualification round continues tomorrow with men’s gymnastics and rhythmic gymnastics. Rhythmic gymnast Elizabeth Kapitonova of Staten Island, N.Y./Isadora, takes to the floor for hoop at 2 p.m. and the ball at 7 p.m. on Oct. 9, local Argentina time. Briones will compete in the men’s parallel bars in the evening session. Live scoring and results are available through the official website. The live stream of gymnastics coverage on the Olympic Channel begins on Oct. 11 with the men’s all-around finals. On the vault, Briones averaged a 14.033 (14.166/13.900) for the top qualification score and a trip to the finals. Felix Dolci of Canada earned a 13.950 for second, followed by Gabriel Burtanete of Romania (13.733). In the still rings qualification round, Briones scored a 13.533 (4.600, difficulty; 8.933, execution) for second in the preliminary ranking and a spot in the still rings final. Japan’s Takeru Kitazono had the event’s top score of 13.700. China’s Yin Dehang was third in the rankings at 13.500. After four of six events, Briones is ranked third in the all-around with a three-event total of 54.232. Kitazono has the top score of 55.433, followed by Yin with 54.732. Oh advanced to the finals via her eighth place finish in the women’s trampoline preliminaries. She tallied a 92.200 total (43.040/49.160). China’s Fan Xinyi had the top women’s score with a 99.100, with Australia’s Jessica Pickering at 94.250 and Switzerland’s Emily Mussmann (93.635). Women’s vault and men’s trampoline were also held today. The top three in the preliminary rankings were: women’s vault – Giorgia Villa of Italy (14.083), Anastasiia Bachynska of Ukraine (13.816), and Emma Spence of Canada (13.791); and men’s trampoline – Ivan Litvinovich of Belarus (108.355), Fu Fantao of China (102.910) and Ruben Tavares of Portugal (102.655). Gymnastics begins with the multi-discipline event, which serves as the qualification round for the finals for each discipline. The Games will be broadcast on the Olympic Channel every night, and OlympicChannel.com and the Olympic Channel app will offer a 24/7 channel with live streams, replays and highlights. For rhythmic gymnastics, athletes perform all four events –hoop, ball, clubs and ribbon – in the qualification round, and the top eight in the qualification rankings advance to the all-around final.